Unique product will allow overhead doors to be locked in virtually any up position. Automatically locks doors in full up position or in the closed position. Prevents the overhead door from unexpectedly "slamming down". Protects personnel, product, and equipment. 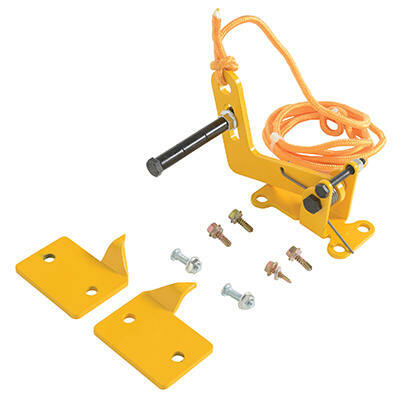 Spring-loaded locking latch is released by pulling rope (included). Simply bolts to any overhead door (installation hardware is not included). Includes two reversible "locking plates" that may be mounted anywhere along door track. Steel construction with yellow painted finish. Model PDF's Description Color Wt.